Charles Fredrick Weisenthal, a German-born engineer working in England was awarded the first British patent for a mechanical device to aid the art of sewing, in 1755. His invention consisted of a double pointed needle with an eye at one end. In 1804, a sewing machine was built by the Englishmen Thomas Stone and James Henderson, and a machine for embroidering was constructed by John Duncan in Scotland. An Austrian tailor, Josef Madersperger, began developing his first sewing machine in 1807 and presented his first working machine in 1814. Having received financial support from his government, the Austrian tailor worked on the development of his machine until 1839, when he built a machine imitating the weaving process using the chain stitch. The first machine to combine all the disparate elements of the previous half-century of innovation into the modern sewing machine was the device built by English inventor John Fisher in 1844, thus a little earlier than the very similar machines built by Isaac Merritt Singer in 1851, and the lesser known Elias Howe, in 1845. However, due to the botched filing of Fisher's patent at the Patent Office, he did not receive due recognition for the modern sewing machine in the legal disputations of priority with Singer, and it was Singer who won the benefits of the patent. Elias Howe, born in Spencer, Massachusetts, created his sewing machine in 1845, using a similar method to Fisher's except that the fabric was held vertically. An important improvement on his machine was to have the needle running away from the point, starting from the eye. After a lengthy stay in England trying to attract interest in his machine, he returned to America to find various people infringing his patent, among them Isaac Merritt Singer. He eventually won a case for patent infringement in 1854 and was awarded the right to claim royalties from the manufacturers using ideas covered by his patent, including Singer. In 1856, the Sewing Machine Combination was formed, consisting of Singer, Howe, Wheeler, Wilson, Grover and Baker. These four companies pooled their patents, with the result that all other manufacturers had to obtain a license and pay $15 per machine. This lasted until 1877 when the last patent expired. James Edward Allen Gibbs (1829–1902), a farmer from Raphine in Rockbridge County, Virginia patented the first chain stitch single-thread sewing machine on June 2, 1857. In partnership with James Willcox, Gibbs became a principal partner in Willcox & Gibbs Sewing Machine Company. Willcox & Gibbs commercial sewing machines are still used in the 21st century. William Jones started making sewing machines in 1859 and in 1860 formed a partnership with Thomas Chadwick. As Chadwick & Jones, they manufactured sewing machines at Ashton-under-Lyne, England until 1863. Their machines used designs from Howe and Wilson produced under licence. Thomas Chadwick later joined Bradbury & Co. William Jones opened a factory in Guide Bridge, Manchester in 1869. In 1893 a Jones advertising sheet claimed that this factory was the "Largest Factory in England Exclusively Making First Class Sewing Machines". The firm was renamed as the Jones Sewing Machine Co. Ltd and was later acquired by Brother Industries of Japan, in 1968. In 1877 the world's first crochet machine was invented and patented by Joseph M. Merrow, then-president of what had started in the 1840s as a machine shop to develop specialized machinery for the knitting operations. This crochet machine was the first production overlock sewing machine. The Merrow Machine Company went on to become one of the largest American Manufacturers of overlock sewing machines and continues to be a global presence in the 21st century as the last American over-lock sewing machine manufacturer. The first electric machines were developed by Singer Sewing Co. and introduced in 1889. By the end of the First World War, Singer was offering hand, treadle and electric machines for sale. At first, the electric machines were standard machines with a motor strapped on the side, but as more homes gained power, they became more popular and the motor was gradually introduced into the casing. A better stitch was found in the lockstitch. The chainstitch is still used today in clothing manufacture, though due to its major drawbacks,it is generally paired with an overlock stitch along the same seam. Lockstitch is the familiar stitch performed by most household sewing machines and most industrial "single needle" sewing machines from two threads, one passed through a needle and one coming from a bobbin or shuttle. Each thread stays on the same side of the material being sewn, interlacing with the other thread at each needle hole by means of a bobbin driver. As a result, a lockstitch can be formed anywhere on the material being sewn; it does not need to be near an edge. Overlock also known as "serging" or "serger stitch", can be formed with one to four threads, one or two needles, and one or two loopers. Overlock sewing machines are usually equipped with knives that trim or create the edge immediately in front of the stitch formation. Household and industrial overlock machines are commonly used for garment seams in knit or stretchy fabrics, for garment seams where the fabric is light enough that the seam does not need to be pressed open, and for protecting edges against raveling. Machines using two to four threads are most common, and frequently one machine can be configured for several varieties of overlock stitch. Overlock machines with five or more threads usually make both a chainstitch with one needle and one looper, and an overlock stitch with the remaining needles and loopers. This combination is known as a "safety stitch". A similar machine used for stretch fabrics is called a mock safety. 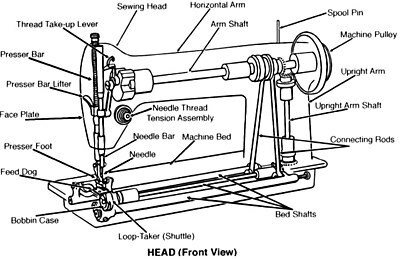 When creating a zigzag stitch, the back-and-forth motion of the sewing machine's needle is controlled by a cam. As the cam rotates, a fingerlike follower, connected to the needle bar, rides along the cam and tracks its indentations. As the follower moves in and out, the needle bar is moved from side to side. Very old sewing machines lack this hardware and so cannot natively produce a zigzag stitch, but there are often shank-driven attachments available which enable them to do so. Besides the basic motion of needles, loopers and bobbins, the material being sewn must move so that each cycle of needle motion involves a different part of the material. This motion is known as feed, and sewing machines have almost as many ways of feeding material as they do of forming stitches. For general categories, there are: drop feed, needle feed, walking foot, puller, and manual. Often, multiple types of feed are used on the same machine. Besides these general categories, there are also uncommon feed mechanisms used in specific applications like edge joining fur, making seams on caps, and blindstitching. The drop feed mechanism is used by almost all household machines and involves a mechanism below the sewing surface of the machine. When the needle is withdrawn from the material being sewn, a set of "feed dogs" is pushed up through slots in the machine surface, then dragged horizontally past the needle. The dogs are serrated to grip the material, and a "presser foot" is used to keep the material in contact with the dogs. At the end of their horizontal motion, the dogs are lowered again and returned to their original position while the needle makes its next pass through the material. While the needle is in the material, there is no feed action. Almost all household machines and the majority of industrial machines use drop feed. Differential feed is a variation of drop feed with two independent sets of dogs, one before and one after the needle. By changing their relative motions, these sets of dogs can be used to stretch or compress the material in the vicinity of the needle. This is extremely useful when sewing stretchy material, and overlock machines (heavily used for such materials) frequently have differential feed. A needle feed, used only in industrial machines, moves the material while the needle is in the material. In fact, the needle may be the primary feeding force. Some implementations of needle feed rock the axis of needle motion back and forth, while other implementations keep the axis vertical while moving it forward and back. In both cases, there is no feed action while the needle is out of the material. Needle feed is often used in conjunction with a modified drop feed, and is very common on industrial two needle machines. Household machines do not use needle feed as a general rule. Some factory machines and a few household machines are set up with an auxiliary puller feed, which grips the material being sewn (usually from behind the needles) and pulls it with a force and reliability usually not possible with other types of feed. Puller feeds are seldom built directly into the basic sewing machine. Their action must be synchronized with the needle and feed action built into the machine to avoid damaging the machine. Pullers are also limited to straight seams, or very nearly so. Despite their additional cost and limitations, pulling feeds are very useful when making large heavy items like tents and vehicle covers. A manual feed is used primarily in freehand embroidery, quilting, and shoe repair. With manual feed, the stitch length and direction is controlled entirely by the motion of the material being sewn. Frequently some form of hoop or stabilizing material is used with fabric to keep the material under proper tension and aid in moving it around. Most household machines can be set for manual feed by disengaging the drop feed dogs. Most industrial machines can not be used for manual feed without actually removing the feed dogs. Sewing machines use special needles tailored to their needs and to the character of the material being sewn. Industrial sewing machines are larger, faster, and more varied in their size, cost, appearance, and task. Industrial machines, unlike domestic machines, perform a single dedicated task and are capable of long hours of usage and as such have larger moving parts and comparatively much larger motors. Industrial machines are also more generic; a motor for almost any type of machine can work on any brand. Sewing feet and bobbins between brands are interchangeable. However, with domestic machines the motor, and to a lesser extent bobbins and sewing feet, are brand specific. The motors on industrial machines, as with most of their components, lights, etc., are separate, usually mounted to the underside of the table. Domestic machines have their OEM motors mounted inside the machine. There are two different types of motor available for industrial machines: a servo motor (which uses less electricity and is silent when not in use), and the more traditional clutch motor (which is always spinning; even when not in use). Before sewing machines were invented women spent much of their time maintaining their family's clothing. Middle-class housewives, even with the aid of a hired seamstress, would devote several days of each month to this task. It took an experienced seamstress at least 14 hours to make a dress shirt for a man; a woman's dress took 10 hours; and a pair of summer pants took nearly three hours. Most individuals would have only two sets of clothing: a work outfit and a Sunday outfit. Sewing machines reduced the time for making a dress shirt to an hour and 15 minutes; the time to make a dress to an hour; and the time for a pair of summer pants to 38 minutes. This reduced labor resulted in women having a diminished role in household management, and allowed more hours for their own leisure as well as the ability to seek more employment. Industrial use of sewing machines further reduced the burden placed upon housewives, moving clothing production from housewives and seamstresses to large-scale factories. The movement to large-scale factories also resulted in a decrease in the amount of time clothing production took, which caused the prices for clothing to drop significantly. This is because manufacturers were able to decrease the number of workers needed to produce the same amount of clothing, resulting in reduced costs. Increased supply also lowered the cost. The initial effects of sewing machines on workers were both positive and negative, however in the long run the negative effects decreased. Many of the women who had previously been busy at home could now seek employment in factories, increasing the income for their family. This allowed for families to be able to afford more sets of clothing and items than they previously could. For seamstresses, home sewing machines allowed them to produce clothing for the average person during periods when demand for fitted clothes was low, effectively increasing their earnings. When industrial sewing machines initially became popular many seamstresses working in factories, as well as those working at home, lost their jobs as it meant that fewer workers could produce the same output. In the long run these now unemployed workers along with thousands of men and children would eventually be able to gain employment in jobs created as the clothing industry grew. The sewing machine's effects on the clothing industry resulted in major changes for other industries as well. Cotton production needed to increase in order to match the demand of the new clothing factories. As a result, cotton became planted in new areas where it hadn't previously been farmed. Other industries involved in the process benefited as well such as metal companies who provided for parts of the machines and shippers to move the increased amounts of goods. In addition to being important for clothing production, sewing machines also became important in the manufacturing of furniture with upholstery, curtains and towels, toys, books, and many other products. ^ "Sewing Machine Beginning". Sewing. Retrieved 2012-12-17. ^ "Sewing Machine History". Retrieved 2013-12-17. ^ "Who invented the first sewing machine?" (PDF). ^ , "Encyclopædia Britannica. Encyclopædia Britannica Online. Encyclopædia Britannica Inc., 2011. Web. 31 Dec. 2011.". ^ Forsdyke, Graham. "Case Against Howe". Retrieved 2013-12-17. ^ Elias Howe Jr., Sewing Machine, United States Patent Office, US Patent 4,750, issued 10 September 1846, expired 1867. ^ e.g. Bill Bryson: Made in America: an Informal History of the English Language in the United States, Black Swan, 1998, ISBN 0-552-99805-2, p. 110. ^ Adam Mossoff, A Stitch in Time: The Rise and Fall of the Sewing Machine Patent Thicket; summarized and discussed at Sewing Machine Blogging, The Volokh Conspiracy. ^ Draznin, Yaffa Claire (2001). Victorian London's Middle-Class Housewife: What She Did All Day (#179). Contributions in Women's Studies. Westport, Connecticut: Greenwood Press. pp. 66–68. ISBN 0-313-31399-7. ^ Reader's Digest Complete Guide to Sewing. Pleasantville, New York: The Reader's Digest Association, Inc., pp. 32–36. Wikimedia Commons has media related to Sewing machines. Wikisource has the text of the 1911 Encyclopædia Britannica article Sewing Machines.